We have been producing challenge coins for over 18 years now. It has been a joy to work with our customers to discover how to best design, produce and implement their presentation coin programs. You name it, a custom challenge coin may be the best answer. Whether your goal is to reward good behavior, incentivize donors, encourage kids in school, promote your motion picture or recognize the finest soldiers, sailors, airmen and marines in the world, challenge coins will do it brilliantly. Check out some of our blog entries for unique and exciting ways to use Challenge Coins. I promise there will be at least one use for them that you have not considered before. They are far more than the Military Coins that have become ubiquitous. How about this? Why not develop a challenge coin for weddings? Think about it….The groom can give them to his folks and the bride can give them to her folks. All of the people who the Bride and Groom must recognize taken care of with one order and minimal expense. Maybe you want to support your safety program. What works better (and more affordably) that the “safety challenge” coin? Does your amateur radio club want to recognize its members? A challenge coin, with a place for the recipient to have his/her call-sign engraved locally could easily fill the coffers of your repeater fund with no tail-pulling required. Challenge coins can mean real savings for your business or event. Many corporate events offer “swag” to the participants. With a thoughtful approach, challenge coins can take the place of several expensive items. Consider this. Every participant gets a challenge coin. Then there are silver challenge coins for enthusiastic participants, contest winners and influencers. Finally there are gold challenge coins for speakers and honored guests. All of these requirements easily handled by one affordable solution. Let us show you how easy it can be. At D & R we make your order as easy as we can. We have nearly two decades of experience advising, designing and producing the finest challenge coins available anywhere. We can take your idea and create artwork that achieves your goals. No need for you to look for someone to design your custom coins. We can do it for you. It all begins with an email or a phone call. We will listen to your ideas and goals and create the perfect challenge coin for you. We create your challenge coin design and give you the opportunity to fine-tune it until it is just what you want. And there is never an art charge when you purchase your coins from us. How Much Do Challenge Coins Cost? Many of our competitors post their challenge coin prices online. We do not. The reason is that your custom price is just an email or phone call away. If we priced our coins we would have to create a price that charges for every little feature. We take a different approach. We do not charge exorbitant prices for epoxy, sandblasting or 3d Dies. This practice can make your coins needlessly costly. Over the years we have learned that our customers want the bottom-line, quickly and accurately. The best way to get to that is simply place the call or send an email. What I will tell you about prices is this. We will always beat a competitor’s price on a comparable custom coin. Because I am a retired soldier I know that when it comes to government purchases, service people strive to be good stewards of the taxpayer’s money. We do too. Not do we offer great prices we also can help you design your coin with cost in mind. We can use your budget to get you more challenge coins, more features and greater value. It is all up to you. Give us a chance to show you just how affordable your custom challenge coin can be. With D & R you have a great choice. We can make your coins off-shore or we can make them in the United States. The choice is yours. Each of our factories has its strengths. We can guide you through the decision making process and select the location that fits your design, your budget and your command/corporate philosophy. Just remember that the coins does not have to be an economic one. We have American Made Challenge Coins that can cost less than their foreign made counterparts. The key is design. And as in all aspects of your military coin or custom coin design we can help you come up with a plan that is best for you. The pages of this site are filled with ideas that can help you achieve your challenge coin goals. Pay particular attention to our blog. There are dozens of posts on topics important to the challenge coin user, the military coin creator and the challenge coin collector. I have spent, as I said, almost two decades creating, designing and selling custom challenge coins. I enjoy it very much and like nothing more than discussing them with others. Just the other day I was caught out without a coin in my pocket. I was challenged by someone who knew me and I didn’t have my coin on me. This won’t happen again if I can help it. 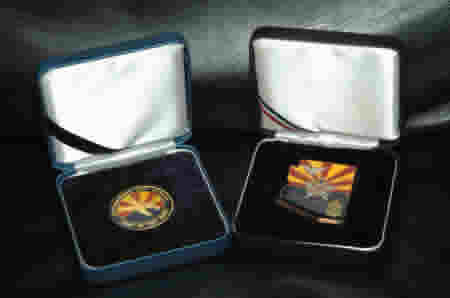 At D & R we are dedicated to making the very finest challenge coins, military coins, custom sports medals and medallions. We love doing it and we value our customers very much. We always try to keep first and foremost in our minds what this particular challenge coin will mean to someone. We do not take lightly the trust you put in us and we will always strive to live up to your trust. We will create a coin that you will be proud to present; that will be an honor to receive, and that will be a lasting monument to the moment in time when the you placed it in their hand. So remember….We are a manufacturer of challenge coins and military coins. We offer custom coins from both overseas and US factories depending on your requirements.